In a gala ceremony held on Thursday night at Sharjah Heritage Institute, the rule of Sharjah, Sheikh Sultan Bin Mohamed Al-Qasimi, honoured the Historic Cairo Rehabilitation Project with the award for the Best Practices for Conservation of Cultural Heritage in the Arab World, alongside nine other winners. Mohamed Abdel Aziz, Egypt's assistant antiquities minister for Islamic and Coptic antiquities, told Ahram Online that Egypt was one of 40 participants at the exhibition this year. 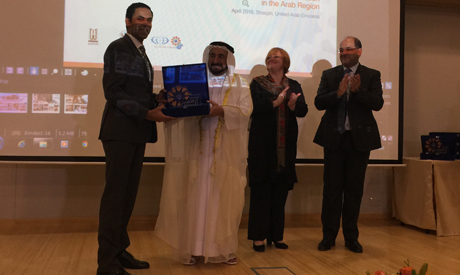 Egypt, represented by the Historical Cairo project, along with the UAE, Jordan, Lebanon, Libya, Morocco, Palestine, Syria, Sudan and Tunisia, won the award for Best Practices for Conservation of Cultural Heritage in the Arab World. He added that the event was part of activities of Sharjah-based ICCROM-ATHAR (Architectural and Archaeological Tangible Heritage in the Arab Region), a regional conservation centre founded by ICCROM (International Centre for the Study of the Preservation and Restoration of Cultural Property) and the Government of Sharjah in the UAE in 2012. ATHAR focuses on architectural and archaeological tangible heritage in the region including heritage collections, rich and varied historic places, sites and monuments.